I have written, tweeted, instagramed and swooned over Scarlett & Jo very many times before - and to be honest with you, the chances are that I will do it again. Not only do Scarlett & Jo offer up a number of choices when it comes to clothing, but they actually listen to their customers. For example, they recognise that not everyone wears dresses so they now offer skirts and have recently launched a number of 'separates' items - great news! What I also love about Scarlett & Jo is the support that they show bloggers - from dresses designed for them to random packages arriving on doorsteps 'just because' they're a brand that really do what they can to please people! Of course, when you add on the fact that they offer pretty dresses up to a size 32, they're winners in my heart! So anyway, a few weeks ago they sent me this Navy 2 in 1 Prom Dress to try and it's a winner. I love the fact that it is a navy material rather than black, which is fantastic! It gives it something a bit different to the norm. It has the now infamous thick elasticated waist that lots of the dresses and skirts from Scarlett & Jo now have. I love this because it brings everything in and gives it a nice shape - winner in my book. As all of their prom dresses do, it has a slight netting underneath the skirt too which gives it a lovely lift. The sizing is great and the top part of the dress being a thick, almost elasticated type material gives everything a really nice shape and feel. I wore this out to a local carnival the other day and it was comfortable to wear for the whole day. On that occasion I wore it with leggings, so it works as a dressed down look too! 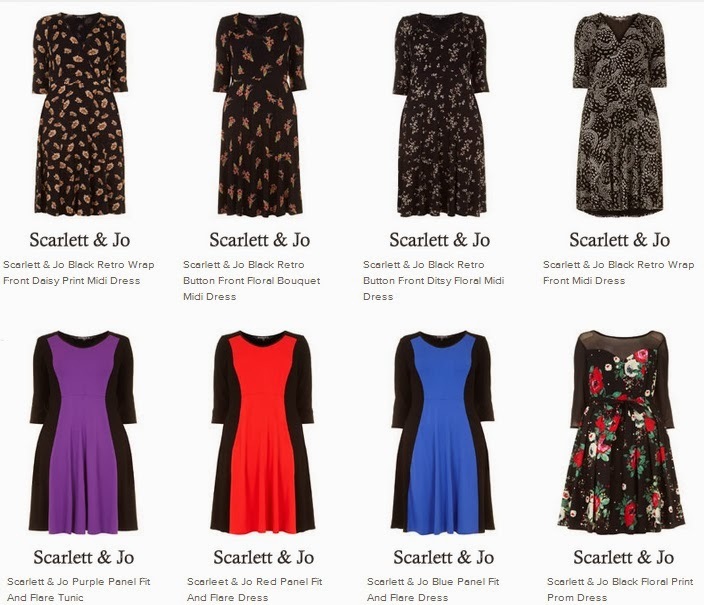 Do you own anything from Scarlett & Jo? What are your favourite pieces? P.S I have dreams of a 2 in 1 prom dress in a cherry print - how cute would that be? You'll know that earlier this week I was invited to Evans at Marble Arch to view their Cut For Evans range. While I was there I took the chance to have a sneaky peak around the rest of the store, because I just don't get to this side of town often enough. I have kept my eye on the Scarlett and Jo dresses on the website, but I have to be honest there was nothing quite like seeing them in the flesh. The prom dress jumped out at me - it's such a vibrant colour and nice shape. 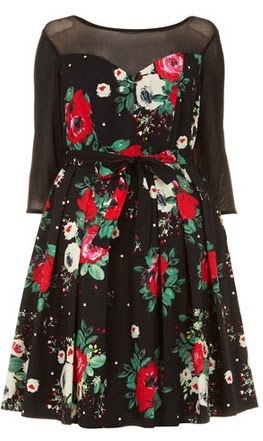 I don't own many 'pretty' dresses like that, but it's definitely one that I would like to have hanging in my wardrobe. Scarlett & Jo first made a name for themselves with their Power Fit dresses which have gone down an absolute storm. You might remember that I reviewed the leopard print one a while back. What I love now is how they're expanding and offering so many more different shapes and styles, which helps to ensure that there is something for everyone. It's really lovely that all of these come from Scarlett & Jo - just because they are all so different. I am really trying to expand the type of dresses I have in my wardrobe - I love skater dresses but I would love to step out and try something new. What are your fashion plans for 2014? Do you want to mix it up a bit?